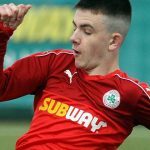 Ross Lavery struck the pick of the goals as Cliftonville comfortably disposed of Newry City in this evening’s friendly at Solitude. Played in scorching hot conditions, the game took its time to spring into life and an own goal was required to open the floodgates, with Jay Donnelly and Joe Gormley each following up with doubles ahead of Lavery’s eye-catching effort. Boss Barry Gray named five changes to the side which overcame a Swansea City XI at the weekend, but it was the familiar figure of Chris Curran who came closest to breaking the deadlock only to see his fizzing strike cannon off the underside of the crossbar before being fielded by goalkeeper Steven Maguire. The visiting stopper then gathered a Donnelly header and thwarted Gormley before getting down well to save from Lavery. The winger retrieved possession out wide, however, and delivered a cross that was turned into his own net by a defender – although Stephen Garrett was happy to take the credit afforded by the Solitude PA address. Gormley saw two attempts go to waste ahead of Donnelly making t 2-0 when, threaded through on goal by Chris Curran, he rounded Maguire and steered the ball into an empty net. 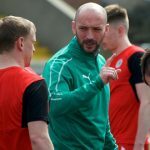 The first-half ended on a bizarre note when Gormley appeared to have scored with a scrambled finish and it took quite some time – indeed, the teams had left the field – before confirmation was ascertained that referee Ross Dunlop had disallowed the goal. Gormley would not be denied, however, and got himself on the scoresheet early in the second period; converting after substitute keeper Kieran Gordon had blocked his initial effort. Lavery made it four with a fine individual strike that saw him claim possession outside the area and skilfully twist his way backwards past two defenders before spinning to execute a fierce left-footed drive that rocketed into the bottom corner. It wouldn’t be long before Gormley made it five. 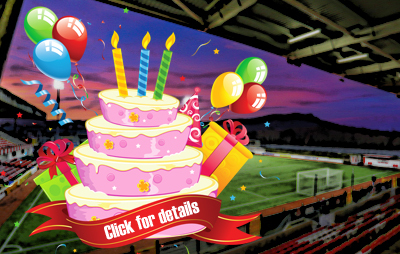 Attempting to tee Daniel Hughes up for a strike at goal, his intended pass was cut out by a Newry defender and the ball returned to Gormley on the byline – a position from which he negotiated the acutest of angles to convert. Donnelly would wrap things up in the closing minutes and it’s fair to assume that, had he known much about the strike, it would have rivalled Lavery’s for sheer individual brilliance. As it was, however, the backheeled-lob that lifted the ball over his own head and that of the keeper appeared entirely accidental as he attempted to react to Gordon’s save from Hughes. REDS: Neeson, McGovern, Breen, Ramsey, Curran, Garrett, A Donnelly, Bagnall, Gormley, J Donnelly, Lavery. Subs: Dunne (for Neeson), Hughes (for Garrett), M Donnelly (for Ramsey), Caldwell (for Curran).